This is such a classic recipe. I've seen it countless times on Nigella and Jamie Oliver shows, but I've never tried making it before. I guess I was never a fan of creamy sauces. They make the dish so heavy, I could never finish them. But one day, the cosmic forces were aligned, and I just happened to have all the available ingredients for it, so I made it as my two-year-old daughter's dinner. I may not be a fan of cream sauces, but I think it's great for kids. All the cream, eggs and cheese make the dish high in protein and calcium, great for young developing children! Anyway, back to the recipe. If you have the ingredients at hand, this is actually a very simple pasta dish to make. 1. Chop up the bacon into small pieces and pan fry them with low fire till crisp. Meanwhile, boil the pasta according to instructions on the packaging. 2. Mix the rest of the ingredients together in a small bowl. 3. 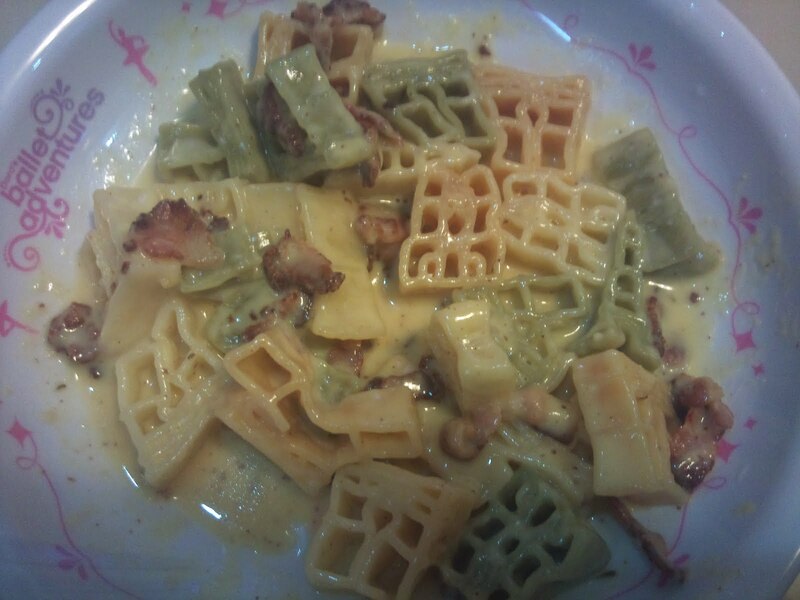 When the pasta is cooked, toss the pasta with the bacon and it's oil. 4. Switch off the fire and add the egg and cheese mixture into the pasta.